Elizabeth Nyamayaro is Senior Advisor to the Under-Secretary-General of UN Women and Head of HeForShe Initiative, a global solidarity movement which seeks to engage men and boys as advocates for gender equality. A strong advocate for women rights and economic empowerment, Ms. Nyamayaro has worked at the forefront of Africa’s development agenda for more than a decade in both the public and private sector, and previously held positions with UNAIDS, World Health Organization and the World Bank. Prior to UN Women, she was Director External Affairs & Policy, Africa and part of the Corporate Strategy Office at Merck. 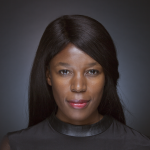 Born in Zimbabwe and a Political Scientist by training, Ms. Nyamayaro holds a MSc in Politics from the London School of Economics and Political Science. We often think of gender inequality as a women’s issue, the same way we think racism or religious discrimination only impact people with a certain skin color or those who hold particular beliefs. The truth is when any part of society is marginalized, we all suffer. We are all a little less than we could be. Working toward equality is a whole-of-society issue and something that requires all hands on deck. When UN Goodwill Ambassador Emma Watson launched HeForShe in 2014, we were simply amazed that 100,000 men and boys signed up almost immediately to be advocates for gender equality. Within days, at least one man in every country in the world added his name to the HeForShe website. It was imminently clear that many men understood that women’s empowerment is actually everyone’s empowerment. With this knowledge, we set out to work with men in leadership positions, including in the corporate world, who are dedicated to equality and willing to make concrete commitments to bring about change as quickly as possible. The World Economic Forum has predicted it will now take 170 years for women to earn as much as men for the same work if we continue at the current rate. Who wants to wait that long? 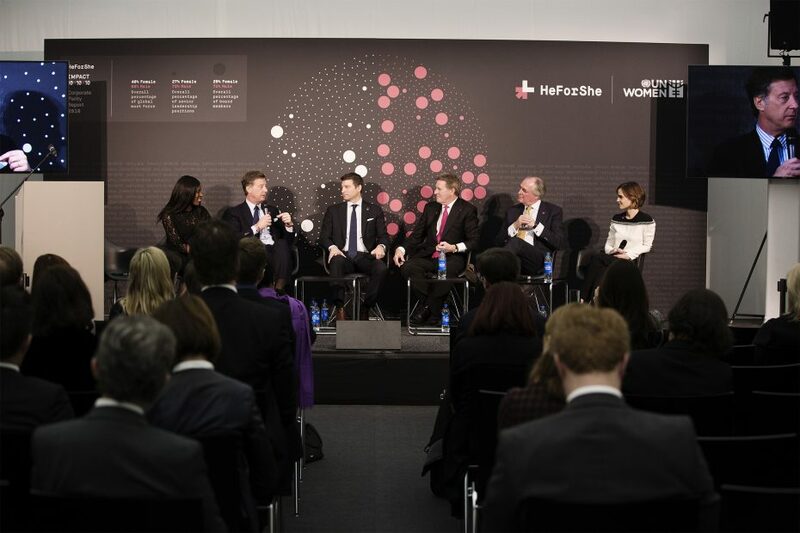 So in 2015, we launched our IMPACT 10x10x10 initiative at the World Economic Forum in Davos. IMPACT 10x10x10 is a top-down initiative that engages ten Heads of State, ten CEOs of major corporations and ten university Presidents in making three game-changing commitments that will fast-track the journey to equality. These commitments, which will be monitored over a 3-5 year period, must be measurable and include a parity indicator. They cover issues such as closing the wage gap, implementing paid parental leave, ensuring parity at senior leadership and board levels, ending child marriage, closing the gender gap in STEM programmes at universities and more. IMPACT Champions must agree to the highest level of transparency and release their data every year. Their mission is bold and some would even say radical: to achieve gender equality by 2020. • In a historic move, IMPACT Champion McKinsey has made its gender parity date public for the first time in the company’s 90 year history. This information will help the company move from women comprising 30% of new hires to its desired 50%. • While PricewaterhouseCoopers had already achieved parity at intake, with women representing about 50% of graduate hires, there were few women at the senior leadership level. In just nine months, PwC female senior leadership has moved from 22% to 44%. • Tupperware, which has committed to a gender action plan to achieve 50/50 equality in every part of the business value and supply chain, has reached parity at board level, moving from 40% to 50%. We’ve also seen progress at the Head of State level that will no doubt impact the business world considerably. Iceland, for example, is on its way to ensuring equal pay for all citizens by 2022. The government’s strategy includes auditing every single company from the biggest corporation down to the smallest enterprise. Our hope is that these pioneers are beginning a new era of increased transparency and ambitious goal-setting to obtain parity in the business world and beyond. We would like other companies and institutions to follow their lead and make transparency, equality and diversity part of their core strategies, a tactic that has proven to lead to better results. We engage men as advocates for gender equality, not only because it’s the right thing to do, not only because it’s good for business, but because when our societies are better we’re all a little better. Since at the moment men still make up 95% of the world’s CEOs and not to mention the lion’s share of senior management, we’ll continue to look to men as partners on the road to equality. At UN Women, our Executive Director, Phumzile Mlambo-Ngcuka likes to remind us that even though it would be great to break the glass ceiling, we’d be just as happy for a man to remove it.